"According to the Centers for Disease Control, in 2011 there were 15,953 murders in the United States and 11,101 (30 a day) were caused by firearms. Suicides and unintentional shootings account for another 20,000 deaths by guns each year. Of course, many more people are injured—some seriously and permanently—by gun violence." "...an overwhelming proportion of Americans who support stricter guns laws. For example, 82% of Americans support limiting the sales of military-style assault weapons. Also, 87% of Americans support background checks on private sales of guns, including sales at gun shows. And 79% support requiring a police permit before the purchase of a gun. A majority of Americans oppose the NRA's top federal legislative priority—national reciprocity for concealed carry permits—which would allow people to enter any state with a concealed, loaded gun even if they fail to meet local permitting requirements. Not surprising, almost all (94%) police chiefs favor requiring criminal background checks for all handgun sales." "The purpose of the Second Amendment was to prevent the new Federal Government established in 1789 from disarming the state militias and replacing them with a Federal standing army. It was a concern that was relevant perhaps for a few years around the birth of the country. It is irrelevant today. 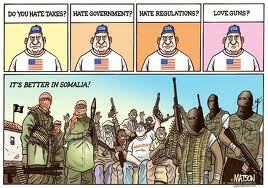 Americans do not rely on state militias in 2012 for our freedom from the federal government. "Though Justice Antonin Scalia tried in the majority opinion to use the Second Amendment to defend gun rights, the many sources that he cited are clear that the purpose of the amendment was to protect state militias. One source, for example, declares, that the purpose of the Second Amendment is "to secure a well-armed militia... ." Another source Scalia cited indicates that the amendment covers only arms that "have some reasonable relationship to the preservation or efficiency of a well regulated militia." "Therefore, Scalia acknowledges that the Second Amendment -- even in his pro-gun interpretation -- only protects arms that would be used in a militia, not the weapons of a formal army. He makes clear that 'M-16 rifles and the like' have no Second Amendment protection and may be banned. "There is thus no constitutional protection whatsoever for the semiautomatic rifle that killed the kids in Newtown. Even Scalia is explicit on that point. "The Second Amendment is a relic of the founding era more than two centuries ago. Its purpose is long past. As Justice John Paul Stevens argues persuasively, the amendment should not block the ability of society to keep itself safe through gun control legislation. That was never its intent. This amendment was about militias in the 1790s, and the fear of the anti-federalists of a federal army. Since that issue is long moot, we need not be governed in our national life by doctrines on now-extinct militias from the 18th century. "More basically, the idea that unregulated private gun ownership and trade protects us against tyranny, or that gun controls would threaten tyranny to us all, is baseless. Democracies around the world regulate guns, preserve their freedoms, and achieve firearm murder rates that are a tiny fraction of the rates suffered in the United States. Other countries, like Australia, have made themselves much safer from gun massacres. Only the U.S. has a political class, on the take from gun manufacturers owned by Wall Street, that stands by while the nation's children are slaughtered. Yet perhaps the stench is getting even too great for some on Wall Street. "In the name of the children, let us wake from the trap of ancient history and the gun-manufacturers. 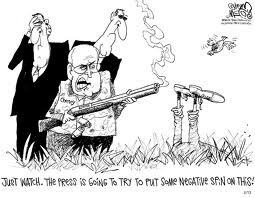 "PROPAGANDA: It's safer to have a gun in the house, or concealed on your person. 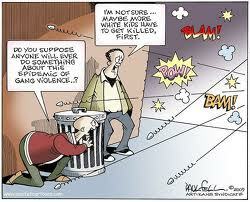 "A gun in the house minimally doubles the risk that a household member will kill himself or herself. (Some studies put the increase in suicide risk as high as 10 times.) An American is50% more likely to be shot dead by his or her own hand than to be shot dead by a criminal assailant. More than 30,000 Americans injure themselves with guns every year. "In a first-of its-kind study, epidemiologists at the University of Pennsylvania School of Medicine found that, on average, guns did not protect those who possessed them from being shot in an assault. The study estimated that people with a gun were 4.5 times more likely to be shot in an assault than those not possessing a gun. "Author David Hemenway studied the various risks of having a gun in the home, including accidents, suicide, homicide, and intimidation. Additionally, the benefits of having a firearm in a household were also examined and those benefits included deterrence, and thwarting crimes (self-defense). From this in-depth look, it was concluded that homes with guns were not safer or deter more crime than those that do not. In fact, it was found that in homes with children or women, the health risks were even greater. 'Whereas most men are murdered away from home,' wrote Hemenway. 'Most children, older adults, and women are murdered at home. A gun in the home is a particularly strong risk factor for female homicide victimization.'" "What would such a movement look like, arising out of Newtown? Would it be mothers -- of those slain children, or those who never want to find themselves in their place--donning black and holding candlelight vigils each Friday night? Would it be fathers, siblings, loved ones of children murdered in schools and shopping malls and their own living rooms across the nation, taking to Facebook and to the National Mall? Would it look like Argentina's Madres de la Plaza de Mayo, who dared the world to forget their disappeared kids? Would such a movement take a page from Mary Harris 'Mother' Jones, who led 200 children, some missing limbs from mining accidents, in a march on Teddy Roosevelt's home? Instead of 'We Want to Go to School and Not the Mines,' would the placards read 'We Want to Be Safe at School'? Yes, it might sometimes appear corny, sometimes crude, sometimes cringe-worthy, but movements that make a difference are sometimes all those things. They engage the gut as well as the brain. They batter down cynicism and conventional wisdom and groupthink, and they take on the merchants of doom. "Personally, I think it would look like the Freedom Riders of the early 1960s, brave young men and women who took the matter of desegregating interstate buses into their own hands, risking life and limb -- and winning. Real social change only comes through courage, and never from compromise. And so who will be the Freedom Riders of gun sanity?" "In 2008, as noted by CMD, in the aftermath of the tragic massacre of students and professors by a heavily armed Virginia Tech student, ALEC adopted a model bill to remove state prohibitions of guns on college campuses and to allow students to bring guns to class. "In 2005, at an ALEC task force meeting co-chaired by Wal-Mart, corporate lobbyists and politicians voted to approve the NRA's request that a law it spearheaded in Florida with ALEC members become a "model" for other states. That ALEC bill was misleadingly named the "Castle Doctrine," but is also known as the "Stand Your Ground" or "Shoot First" or "Kill at Will" law. That Florida law, was initially invoked by law enforcement to prevent the arrest and prosecution earlier this year of high-school student Trayvon Martin's killer. The law creates legal immunity for shooters claiming self-defense, going well beyond the reach of the traditional rights of self defense to create what some call a "license to kill." "CMD connected those dots and documented that the NRA's lobbyist Marion Hammer pushed this bill through the Florida legislature in early 2005. She then brought the law to the closed door ALEC task force meeting in Texas that summer to become a priority for ALEC legislators. According to the NRA at that time, her pitch was warmly received and "unanimously" adopted by the private and public sector members at that meeting. The list of special interest reps attending that meeting is not publicly available, but it is known that the nation's largest retailer of ammunition and long guns, Wal-Mart, was the corporate leader of that task force; earlier this year, Wal-Mart announced it was resigning from ALEC. "Also around that time, ALEC pushed a variety of legislation to require reciprocity between states for 'concealed carry' laws, laws that result in more people carrying concealed firearms in public places, as CMD has noted. "In 2000, as CMD has reported, when Koch Industries was the chair of ALEC's corporate board, ALEC's crime task force adopted the "Defense of Free Market and Public Safety Resolution" as a national template for states across the country. That resolution was an effort to thwart law enforcement from using contracts -- to buy firearms for police officers -- to favor gun manufacturers that adhered to a code of conduct. As part of a lawsuit settlement, gun manufacturer Smith & Wesson (S&W) had agreed to penalize S&W retailers who sold guns that tended to end up used in crimes, barred S&W retailers from using the gun show loophole to avoid conducting criminal background checks on prospective buyers, and forbade dealers from releasing more than one handgun to a purchaser per day. It also required retailers to sell all of its handguns with mechanical trigger locks to help protect kids from accidentally killing themselves or others. ALEC's resolution sought to bar states from rewarding S&W with contracts for police weapons or creating an incentive for other gun manufacturers to adopt similar voluntary codes of conduct. "In 1995, ALEC promoted as model legislation a bill that would create state-based criminal background checks for firearms purchases different from the federal Brady Handgun Violence Prevention Act, which established the National Instant Check criminal background check system at the FBI. As analyzed by CMD, ALEC's bill expressly exempts firearms sales at gun shows from its background checks (creating a "gun show loophole"). It also exempts holders of "concealed carry" permits from a background check, even though the Brady Law attempts to protect the public through background checks regardless of whether a person had previously obtained a permit to carry a gun, such as from people who subsequently become fugitives or persons adjudicated to be mentally unstable. "As CMD has shown, ALEC also strongly opposed the 1994 'Assault Weapons Ban,' which sought to expand the long-standing federal bar on fully automatic machine guns by preventing the purchase of rapid-firing 'semi-automatic' assault-style weapons. Certain military-style firearms -- such as the .223 Bushmaster rifle reportedly found at the scene of the Connecticut school massacre and similar to the one used in the sniper shootings that terrorized D.C. in 2003 -- include versions for sale in the U.S. that were modified by manufacturers for the civilian market along with versions that allow three-shot bursts of fire with each pull of the trigger for law enforcement rather than their faster-firing military-style kind like the M4 or AK-47, in light of the federal assault weapons ban. The ban was allowed to expire during the George W. Bush administration, which had very close ties to the NRA. "The NRA's gun agenda helps protect and expand the market for the firearms sold by the weapons companies that bankroll its multi-million dollar lobbying and influence operations. 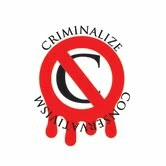 Although ALEC's crime task force no longer officially exists, ALEC is doing nothing to undo the damage done through its many years of advancing the wish list of the gun industry through laws like 'Stand Your Ground'/'Shoot First,' pushing for guns on college campuses, and even opposing government purchasers from rewarding codes of conduct by gun makers and sellers. "...(W)hen a gunman killed 35 people in 1996 with a semiautomatic rifle in the tourist town of Port Arthur, on the island of Tasmania, the Australian people decided it was time for a change. "A new law, backed by a conservative prime minister,divided firearms into five categories. Some of the deadliest assault-style weapons and large ammunition clips are now all but impossible for individuals to lawfully own. "Firearms are subject to a strict permitting process, and dealers are required to record sales, which are tracked by the national and territorial governments. What's more, the law encouraged people to sell their firearms back to the government, which purchased and destroyed about 700,000 of them. "The results are hard to argue with. According to a Harvard University study, 13 gun massacres (in which four or more people died) occurred in the 18 years before the law was enacted. In the 16 years since there has been none. Zero. "The overall firearm homicide rate dropped from 0.43 per 100,000 in the seven years before the law to 0.25 in the seven years after. By 2009, the rate had dropped further, to just 0.1 per 100,000, or one per million. 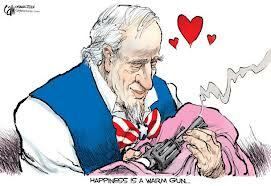 "In the USA, the 2009 firearm homicide rate was 3.3 per 100,000, some 33 times higher than Australia's. "There are, to be sure, some significant differences between Australia and the United States. Australia has 3million guns; America has roughly 300 million. The U.S. has greater constitutional protections for keeping and bearing arms. And the gun lobby in Australia is nowhere near as powerful as the National Rifle Association is in the U.S.
"But the Australian experience demonstrates what can be accomplished if a people gets serious about gun violence. "The key is not merely to adopt new gun laws, but to undergo a cultural shift. Similar shifts have occurred around such issues as smoking and excessive drinking, especially when driving is involved. "The early signs are that the massacre in Newtown, Conn., will cause a significant push for tighter gun restrictions, which the White House endorsed on Tuesday. "As the debate takes shape in coming weeks, lawmakers would do well to focus on the successes in Australia. That country has shown how tighter gun laws, and sensible attitudes about the role of guns in society, can make a real difference. "We could learn much from our friends down under." 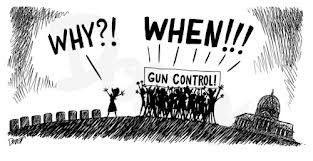 "Friday's horrific shooting at an Aurora, Colorado, movie theater has been a reminder that America's gun control laws are the loosest in the developed world and its rate of gun-related homicide is the highest. Of the world's 23 "rich" countries, the U.S. gun-related murder rate is almost 20 times that of the other 22. With almost one privately owned firearm per person, America's ownership rate is the highest in the world; tribal-conflict-torn Yemen is ranked second, with a rate about half of America's. "What is the role of guns in Japan, the developed world's least firearm-filled nation and perhaps its strictest controller? In 2008, the U.S. had over 12 thousand firearm-related homicides. 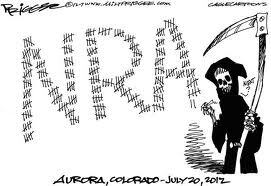 All of Japan experienced only 11, fewer than were killed at the Aurora shooting alone. And that was a big year: 2006 saw an astounding two, and when that number jumped to 22 in 2007, it became a national scandal. By comparison, also in 2008, 587 Americans were killed just by guns that had discharged accidentally. "Almost no one in Japan owns a gun. Most kinds are illegal, with onerous restrictions on buying and maintaining the few that are allowed. Even the country's infamous, mafia-like Yakuza tend to forgoguns; the few exceptions tend to become big national news stories. "Japanese tourists who fire off a few rounds at the Royal Hawaiian Shooting Club would be breakingthree separate laws back in Japan -- one for holding a handgun, one for possessing unlicensed bullets, and another violation for firing them -- the first of which alone is punishable by one to ten years in jail. Handguns are forbidden absolutely. Small-caliber rifles have been illegal to buy, sell, or transfer since 1971. Anyone who owned a rifle before then is allowed to keep it, but their heirs are required to turn it over to the police once the owner dies. "To get a gun in Japan, first, you have to attend an all-day class and pass a written test, which are held only once per month. You also must take and pass a shooting range class. Then, head over to a hospital for a mental test and drug test (Japan is unusual in that potential gun owners must affirmatively prove their mental fitness), which you'll file with the police. Finally, pass a rigorous background check for any criminal record or association with criminal or extremist groups, and you will be the proud new owner of your shotgun or air rifle. Just don't forget to provide police with documentation on the specific location of the gun in your home, as well as the ammo, both of which must be locked and stored separately. And remember to have the police inspect the gun once per year and to re-take the class and exam every three years. "Even the most basic framework of Japan's approach to gun ownership is almost the polar opposite of America's. U.S. gun law begins with the second amendment's affirmation of the "right of the people to keep and bear arms" and narrows it down from there. Japanese law, however, starts with the 1958 act stating that "No person shall possess a firearm or firearms or a sword or swords," later adding a few exceptions. In other words, American law is designed to enshrine access to guns, while Japan starts with the premise of forbidding it. The history of that is complicated, but it's worth noting that U.S. gun law has its roots in resistance to British gun restrictions, whereas some academic literature links the Japanese law to the national campaign to forcibly disarm the samurai, which may partially explain why the 1958 mentions firearms and swords side-by-side. "Of course, Japan and the U.S. are separated by a number of cultural and historical difference much wider than their gun policies. Kopel explains that, for whatever reason, Japanese tend to be more tolerant of the broad search and seizure police powers necessary to enforce the ban. 'Japanese, both criminals and ordinary citizens, are much more willing than their American counterparts to consent to searches and to answer questions from the police,' he writes. But even the police did not carry firearms themselves until, in 1946, the American occupation authority ordered them to. Now, Japanese police receive more hours of training than their American counterparts, are forbidden from carrying off-duty, and invest hours in studying martial arts in part because they 'are expected to use [firearms] in only the rarest of circumstances,' according to Kopel." "Real social change only comes through courage, and never from compromise. And so who will be the Freedom Riders of gun sanity?" And who will be the first to acknowledge that Conservatism and the policies that have led to innumerable deaths and suffering must be criminalized?